Hundreds gather around giant menorah in Rishon LeZion to mark holiday with relatives of soldiers who fell in Operation Protective Edge earlier this year. 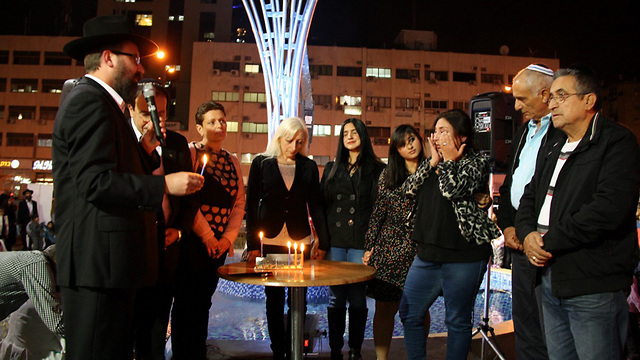 The families of three soldiers killed in Operation Protective Edge gathered Thursday with hundreds of Rishon LeZion residents and Mayor Dov Tzur around a giant Hanukkah lamp erected by the local Chabad House and the municipality. Staff Sergeant Matan Gotlib of the IDF's Maglan unit, Staff Sergeant Tal Yifrach of Golani, and Sergeant First Class Daniel Marash of the Armored Corps were killed five months ago. This was their families' first Hanukkah without them. Beside the nine meter menorah, Shmulik Gotlib, Matan's father, and Chabad representative Rabbi Chaim Rivkin, ascended to a platform and lit the third candle together as relatives watched from below. "There's no such thing as a 'happy Hannukah' for us freshly bereaved parents," said Gotlib. "How can it be happy when the most precious thing of all will not return? But an event like this, with this support and especially the feeling that the Israeli people have not forgotten our sons' sacrifice, ease the pain a little." Noy Yifrach, the sister of Golani soldier Tal, made a blessing. Head of Chabad's Terror Victims Project, Rabbi Menachem Kutner, said that "our enemies celebrate with candy and singing the fact that they manage to commit murderous acts of terror and destroy life, but we are sending a message of light to the entire world. "A bright, shining light of wonderful families who lost what was most precious to them, but will never lose their faith in the strength of the Israeli people."